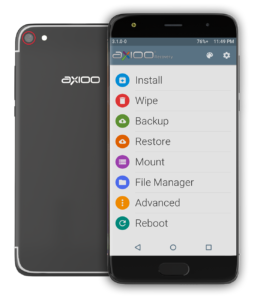 This is a TWRP custom recovery for axioo M6 model. You will need this custom recovery to get root, install custom rom, and some various thing. I made this using omnirom7 base tree with twrp 3.1.0.0. Put the recovery img and the scatter txt file on a new folder. Run the spflashtool, select those scatter txt file and then flash the recovery img. Scroll or choose between item using Vol up button and select them using Vol down button. On this case, choose Recovery then press Vol up button, wait a sec or two … then you’ll be entering recovery mode. There are also many apk on playstore such as Quickboot, RecoveryTool, … etc, that can do reboot into recovery directly from alive system, use any one you like. On a first install this custom recovery, you have to enter the recovery mode immediately after flashing, otherwise the stock rom system protection will restore back the stock recovery and you lose what you just did. This is only one time, once you enter the recovery and installing supersu root or my custom rom, the custom recovery will stay in place.